Hey, art quilters out there! You are a member of SAQA aren't you? Studio Art Quilt Associates is an international group of more than 2400 members, all who love and support the art of the quilt. Just take a look at the website and you'll see some wonderful artwork. Well, yours truly is the new SAQA co-rep for Southern California. I'm actually the SoSoCal rep, because Loris Bogue is the north Southern Cal rep, Jamie Fingal is the central SoCal and I'm the South SoCal. I'm just learning the ropes, so don't ask me any hard questions--but do take a look at SAQA and think about joining. The quilt pictured, Rosewood, was created by wet-felting, then I cut it apart and reassembled it, much like I did for Eucalyptus Zen, that was exhibited at both the Long Beach and Houston International Quilt festival. And this photo doesn't do it justice--it doesn't show the bead work that adds a little shine to the piece. 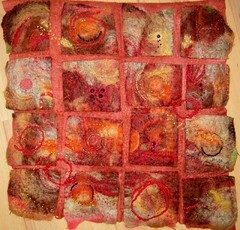 Don't forget I'm teaching wet felting in the San Diego area on January 9. Are you still thinking about doing 2 classes back-to-back this spring?